The short history of modern oceanographic observations—less than a century’s worth, really—doesn’t give us a long track record to evaluate how the ocean’s circulation has operated and changed in the past. Nor does it give us enough data to assess how changes in the ocean shifted Earth’s climate in the past, or how they could cause climate changes in the future. To examine the ocean’s role in climate change, scientists use computer models that simulate the workings of Earth’s ocean and climate. The models point to a possible “switch” that speeds up or slows down a global system of ocean currents that transports heat and warms the North Atlantic region and surrounding continents. It seems likely that any changes in the rate or strength of this circulation would have substantial impacts on climate. Did changes in ocean circulation play a role in melting the vast ice sheets that covered North America and Europe during the last ice age? Could global warming cause ocean circulation changes that lead to dramatic climate changes in the future? In the North Atlantic today, cold surface waters sink to the abyss, and salty, warm surface and near-surface currents, including the Gulf Stream, flow northward from the tropics to replace them. When the warm waters reach high latitudes, they release heat to the atmosphere and warm the region. The waters become colder and less buoyant. They sink to continue this grand ocean overturning, which is approximately equal to 20 times the combined flow of all the world’s rivers. This overturning circulation carries a tremendous amount of heat northward, while also generating a huge volume of cold, salty water—which we call North Atlantic Deep Water. After descending, this great mass of water flows southward, filling up the deep Atlantic Ocean basin and eventually spreading into the deep Indian and Pacific Oceans. Computer climate models show that if fresh water is added to sensitive locales in the North Atlantic Ocean, it would increase surface water buoyancy enough to brake the overturning circulation, and less warm water and heat would flow northward. Nothing like the changes predicted by computer models has ever been seen during the brief interval of modern studies of the sea. So to evaluate the possibilities, scientists must extend oceanography back in time, long before recorded human history, to reveal the full range of possible ocean circulation changes and their impacts on climate. 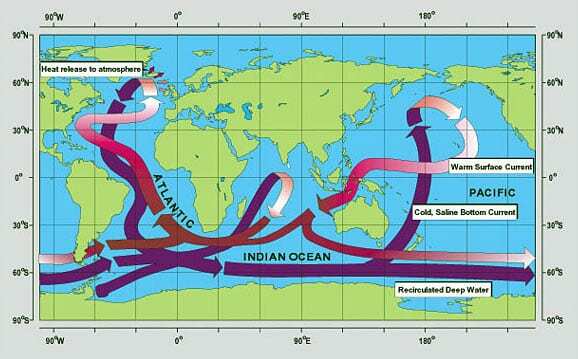 We and other paleoceanographers have found evidence for very different patterns of ocean circulation in the past. This evidence come from clues that are preserved in sediments deposited on the seafloor over tens of thousands of years. The sediments contain fossilized shells of foraminifera—ocean-bottom-dwelling, single-celled organisms the size of sand grains. The shells contain differences in trace elements and carbon isotopes, which reflect different seawater conditions at the times when the foraminifera were alive and growing. The foraminifera analyses showed us where and when different types of water masses formed in the past. Water masses similar to today’s North Atlantic Deep Water seemed to have intensified and diminished in the past—sometimes sinking deeply and spreading to fill the North Atlantic basin and beyond, and sometimes sinking only to intermediate depths and spreading to a far lesser extent. The carbon isotopes and trace elements, however, don’t provide information on how fast or how vigorously these different water masses circulated. To investigate that, we used a different set of clues preserved in deep-sea mud, based on the “clock” inherent in the radioactive decay of naturally occurring uranium in seawater to its daughter isotopes, protactinium and thorium. Both chemically adhere to particles in the ocean that sink to the seafloor. Thorium is inherently “stickier;” however, so it is removed from seawater within decades, while protactinium remains in seawater for centuries. As a result, about half of the protactinium produced in North Atlantic water today lasts long enough in the water column to be exported into the Southern Ocean by the ocean’s overturning system. At times when the rate of overturning circulation slows, the proportion of protactinium buried in North Atlantic sediments increases. Thus, the ratio of protactinium-to-thorium levels in the sediments tells the story of past changes in how fast North Atlantic Deep Water was produced and exported by the overturning circulation. 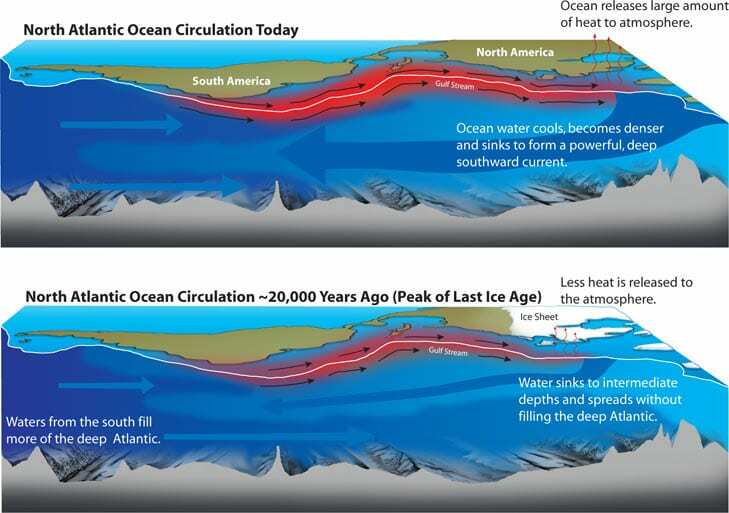 When we compared ocean circulation records to records of climate since the peak of the last ice age 20,000 years ago, we confirmed that the rate of ocean overturning, with its northward heat transport, has a critical influence on climate. When North Atlantic Deep Water filled the deep ocean and spread southward vigorously, the climate of the North Atlantic region was warm and generally stable. When North Atlantic Deep Water filled less of the Atlantic and did not spread southward extensively, the climate was generally cold and more variable. Roughly 14,500 years ago, Earth’s surface was warming, and Northern Hemisphere ice sheets had melted considerably. Paralleling these changes on land were changes in the ocean: North Atlantic Deep Water had already begun filling more of the deep Atlantic basin and was spreading vigorously southward, balanced by a greater flow of warm water northward. About 12,700 years ago, however, this warming trend was abruptly interrupted. Average air temperatures dropped by at least 5°C (9°F) within a few decades and stayed that way for a 1,000-year cold snap. Simultaneously, the presence and vigor of North Atlantic Deep Water dwindled. Some researchers suspect that ice dams melted in front of vast lakes of glacial meltwater, releasing a flood of fresh water to the ocean. During this period, more icebergs drifted and melted into the North Atlantic, perhaps providing an alternative or additional source of fresh water to curtail the overturning circulation. Now we are investigating if there is a similar link between overturning circulation and more modest climate fluctuations, such as the Medieval Warm Period and the Little Ice Age, during the last 10,000 years or so when the Northern Hemisphere was free of large ice sheets. Maybe the lack of ice sheets has reduced the likelihood of glacial outbursts or iceberg discharges, but ample potential freshwater sources still exist, especially in a greenhouse world. Global warming raises the potential of unlocking large amounts of fresh water now frozen in the vast Greenland ice sheet and in Arctic Ocean sea ice. Warming air temperatures could also increase evaporation in low latitudes and transport freshwater vapor toward high latitudes, where it falls as rain or snow into the oceans. Could these factors tip the freshwater balance in the North Atlantic in the future? The answers may lie buried on the seafloor. Funding for this research came from the National Science Foundation, the WHOI Ocean and Climate Institute, and the Comer Science and Education Foundation. Today (top), the ocean's overturning circulation carries a tremendous amount of heat northward, warming the North Atlantic region. It also generates a huge volume of cold, salty water called North Atlantic Deep Water—a great mass of water that flows southward, filling up the deep Atlantic Ocean basin and eventually spreading into the deep Indian and Pacific Oceans.